RV Mirabilis is a fisheries and multidisciplinary research vessel built for the Ministry of Fisheries and Marine Resources of the Republic of Namibia, Image courtesy of STX Europe. Image courtesy of STX Europe. 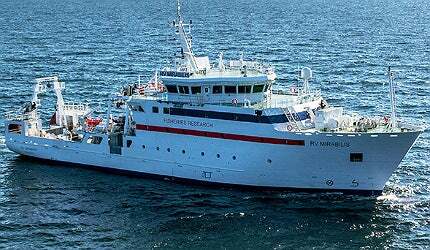 The new Namibian fisheries research vessel was built by STX Finalnd at its Rauma shipyard. Image courtesy of STX Europe. Research vessel Mirabilis with the Namibian flag. Image courtesy of STX Europe. The vessel was delivered to the Namibain Ministry of Fisheries and Marine Resources in June 2012. Image courtesy of STX Europe. Keel-laying of the versatile fisheries research vessel, RV Mirabilis was held in December 2011. Image courtesy of STX Europe. RV Mirabilis is a deep-sea fisheries and multidisciplinary research vessel built for the Ministry of Fisheries and Marine Resources of the Republic of Namibia. She will be used to collect information on fish stocks and their living environment. The vessel was built by STX Finland, a Finnish shipbuilding company which is part of the STX Europe Group. A flag-changing ceremony was held at STX’s Rauma shipyard in June 2012 to mark the delivery of the new research vessel. Construction cost of the vessel is approximately to $41.6m (N$340m). The Namibian government has procured the vessel with the help of the Finnish government, which has provided an interest free loan. The Finnish government, through the Ministry of Foreign Affairs, is paying $22.6m (N$185m) on behalf of the Namibian government to cover the interest incurred on the loan taken for the construction. The new research vessel is built as per the latest standards specified by Bureau Veritas. She can be operated in any African sea, in all weather conditions throughout the year. "The vessel is expected to guide the ministry in critical decision-making by providing vital data on fisheries and marine biology." In February 2011, the Namibian Ministry of Fisheries and Marine Resources ordered the construction of the advanced fisheries research vessel to meet its increasing responsibilities. The new vessel will be operated in place of the ageing research vessel Welwitchia, which was gifted by Japan in March 1994. The current vessel does not support deep water trawling and has limited deck space. Scientific accommodation on board the vessel is also very limited. The new multi-purpose specialised research ship is capable of performing different types of research tasks necessary for the sustainability of fish stocks and the marine environment. The vessel is expected to guide the ministry in critical decision-making by providing vital data on fisheries and marine biology. It will also be used to perform meteorological research and assist in water quality research and analysis. Moreover, she has been equipped to sort, process, freeze and store fish for scientific purposes. FLIP (Floating Instrument Platform) is the US Navy’s oldest, and most unusual, research vessel. The vessel is specifically designed to serve the Namibian fisheries research work. Her hull and propulsion are designed to achieve better serviceability and reduce maintenance costs. Special attention was given to the design of research systems and the power plant system to make sure that the vessel meets the latest performance standards. RV Mirabilis measures 62.4m in length and 14.3m in breadth. The dead weight of the vessel at 4.5m design draught is 640t. The ship’s moulded height to upper deck is 49.7m, while moulded height to main deck is 37.1m. Scantling draught is 4.7m. She can cruise at a speed of 10kts-15kts and carry 44 crew members and research personnel onboard. STX Finland started production of RV Mirabilis in August 2011 at its shipyard in Rauma, which is located about 92km north of Turkuon on the west cost of Finland. The vessel’s keel was laid in December of the same year. Testing and commissioning of the vessel began immediately after she was floated out of her building dock in April 2012. The vessel was handed over to the Ministry of Fisheries and Marine Resources of the Republic of Namibia in June 2012. Raytheon Anschütz, a subsidiary of Raytheon, was contracted by STX Finland in May 2011 to supply an integrated bridge and navigation system for the vessel. "RV Mirabilis is fitted with two radars and two ECDIS (Electronic Chart Display and Information System) bridge workstations." The company also supplied a Dynamic Positioning System (DPS) and a radio station, which complies with the GMDSS A3 safety standard. Navigation sensors, bridge navigational watch alarm system (BNWAS) and wide-ranging communication equipment also formed part of the supply package. RV Mirabilis is fitted with two radars and two ECDIS (Electronic Chart Display and Information System) bridge workstations. These and a conning workstation are all connected through an Ethernet network. The versatile research vessel uses an NP 5100 autopilot to achieve high steering accuracy. There is also a redundant Standard 22 gyrocompass system which controls the vessel’s heading.